In response to our publications, Sprot3 proposed an alternative explanation for our findings: the increase of uCTX-II (expressed in ng/mmol creatine) would not be primarily attributable to increased uCTX-II (in the numerator), but rather to decreased levels of creatine (in the denominator), as women are known to undergo decreases of lean body mass during menopause. To investigate this alternative explanation in our CHECK cohort study,1 ,2 serum creatine (sCreat) levels were assessed in all female CHECK subjects for whom sufficient blood was available after biochemical marker assessment (N=738). sCreat is generally dependent on two major components: glomerular filtration rate and muscle mass. Since glomerular filtration rate can be assumed to be constant in our generally healthy CHECK subjects aged 45–65 years,4 sCreat was interpreted as a marker of muscle mass in our subjects. Associations of sCreat with demographic variables were investigated by linear regression. 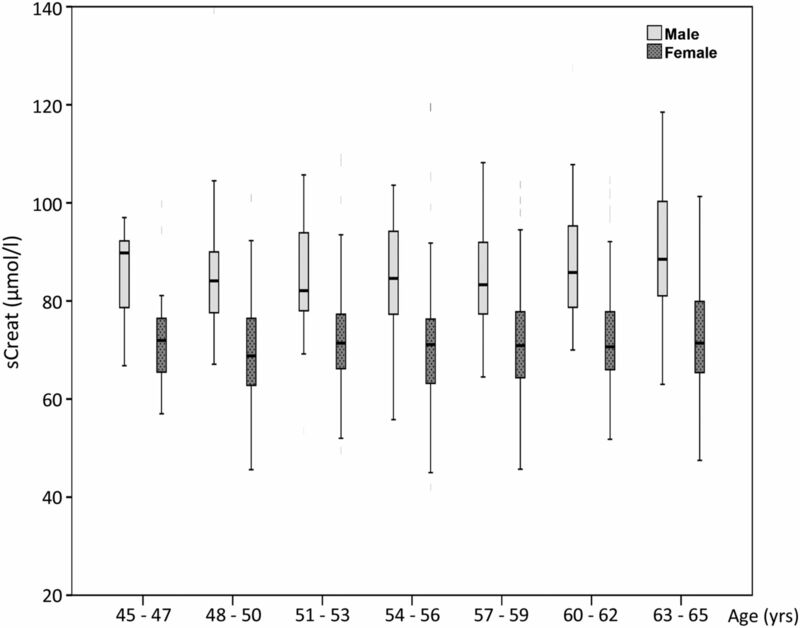 First, associations of sCreat with body mass index and age were investigated in all female subjects for whom sCreat and demographics were known (N=738). There appeared to be no association of sCreat with age (p=0.776), as is shown in table 1 and figure 1. Then, in addition, associations of sCreat with body mass index, age and menopausal status were investigated in women whose menopausal status was known (N=577).1 As was already suggested by the lack of an association between sCreat and age in all women, no association between sCreat and menopausal status was identified in women whose menopausal status was known (p=0.325), as is shown in table 2. Serum creatine (sCreat) levels of different age categories in men and women. Concluding, our data demonstrate that the menopausal increase of uCTX-II in female CHECK subjects is reasonably not based on lean body mass changes, but rather to actually increased release of CTX-II epitope, probably from bone (dependent changes).
. Associations of CTX-II with biochemical markers of bone turnover raise questions about its tissue origin. Ann Rheum Dis 2013;72:29–36.
. Clusters within a wide spectrum of biochemical markers for osteoarthritis. Osteoarthritis and Cartilage 2012;20:745–54.
. Associations of CTX-II with biochemical markers of bone turnover raise questions about its tissue origin. Ann Rheum Dis 2013;72:e20.
. The age related association is more pronounced for cystatin C estimated GFR then for creatinine estimated GFR in primary care patients. Clin Biochem 2013;46:1761–3. Contributors BdK wrote the letter, together with WEvS, using data from the CHECK study with approval of FPJGL. FPJGL helped directing the letter in the end. Ethics approval Local ethical committees of all participating medical centres.